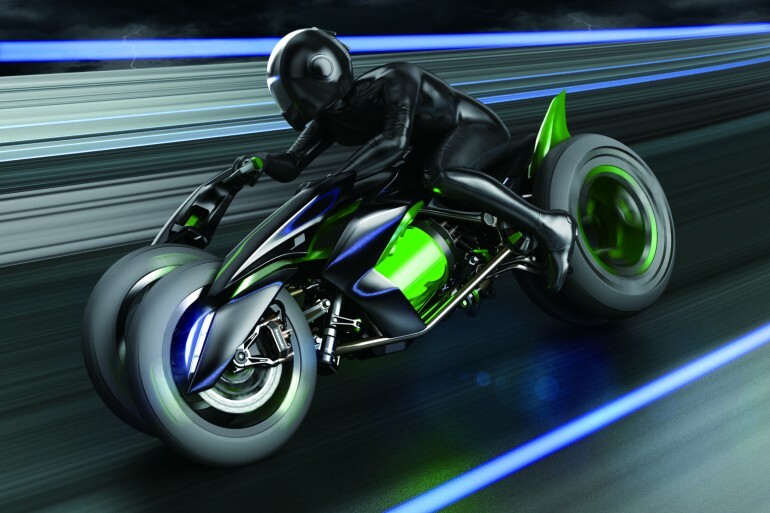 Kawasaki Heavy Industries (KHI) flexed its corporate muscle with a couple of very interesting displays in its booth at the 2013 Tokyo Motor Show this week, including an electric three-wheeler and a supercharged motorcycle engine that could power a new replacement for both its heavyweight ZX14R sportbike and Concours 14 sport-tourer. 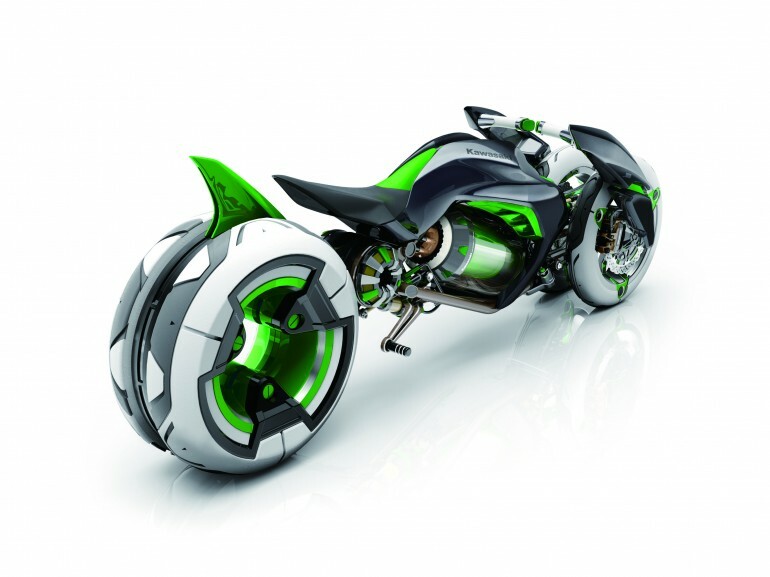 The three-wheeler, simply dubbed the “J,” is familiar to anybody who grew up watching reruns of the Disney movie Tron. 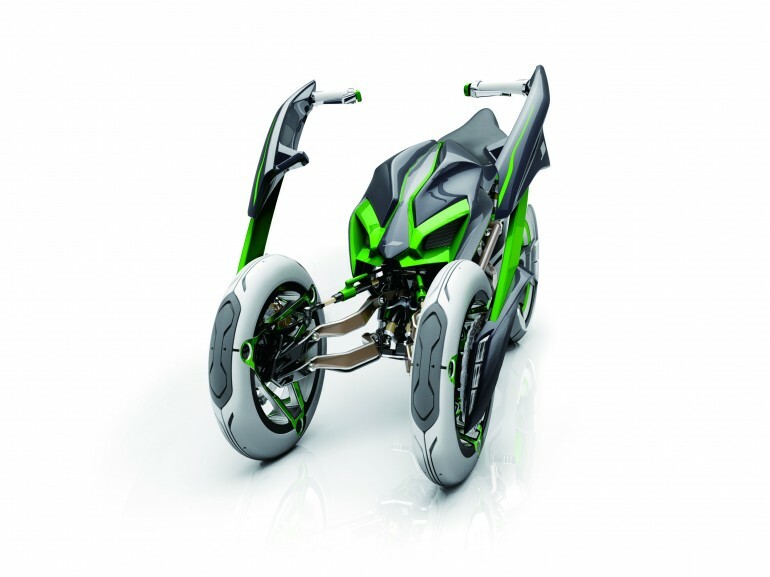 Not only does the J (in theory, as it’s just a concept that will likely never reach production) lean to turn like a single-track vehicle, similar to both the Paiggio MP3 series and Yamaha’s concept three- and four-wheelers, the vehicle’s track can widen or narrow depending on the rider’s needs—lower and narrower for canyon-carving, high and wide for freeway cruising. Power is via “battery cell,” as a way to draw attention to KHI’s Gigacell nickel-metal-hydride industrial batteries. 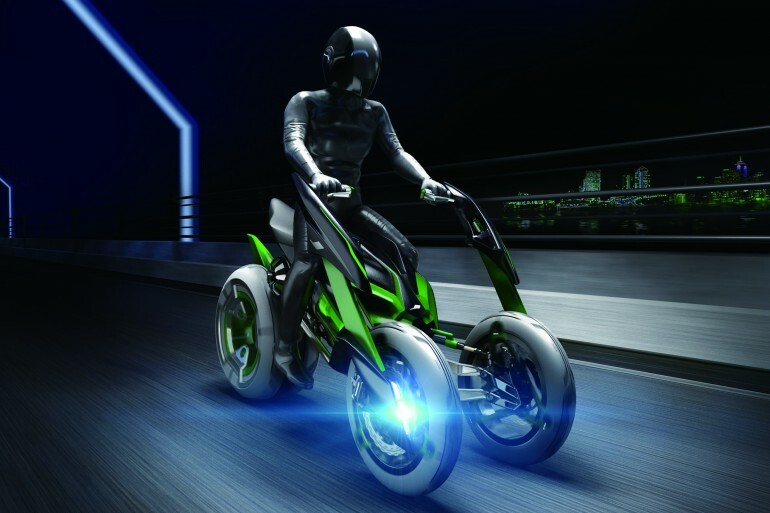 These batteries boast low operating temperatures, fast recharge times and better capacities than similar batteries, but the current (heh, heh) 5.1 kilowatt-hour model is over 4 feet long and weighs 553 pounds, which means that an electric vehicle with Kawasaki Gigacells would have to pack over 1200 pounds of batteries to equal the range of the Zero S. Still, it looks like a fun ride, especially since it steers with a pair of joysticks a la a Mean Green Machine. Kawasaki, better lawyer up—there’s a call from the Huffy people coming. 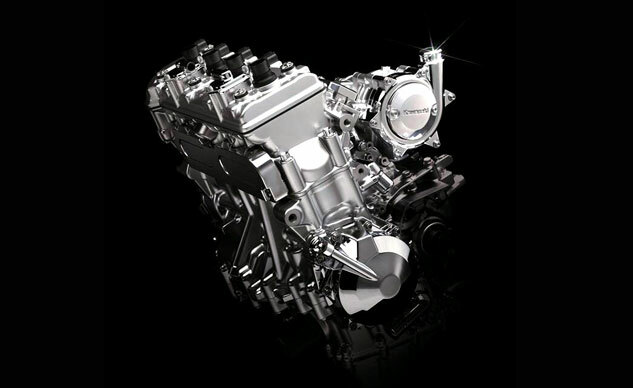 A more tangible product of KHI’s labors is this Supercharged Engine. Back in November 2011, Patent drawings filed by KHI appeared on the Internet showing a motorcycle-specific supercharger mounted in a very ZX-14-ish looking motorcycle. And did you know Kawasaki’s 300X personal watercraft uses a four-cylinder, 1500cc four-stroke that makes 300 horsepower thanks to an “Eaton Twin Vortices Series roots-type supercharger with air-to-water intercooler?” Me neither, and now I’m mad at Kawasaki for assuming recreational boaters in bikinis and lifejackets can handle 300 hp better than we can (granted, it’s limited to 62 mph and there are less things to run into on the water). In any case, there have been rumors flying since 2009 that KHI is building a supercharged ZX-14R replacement. Yamaha previewed both its VMAX replacement and FZ-09 by first showing the engines, so it makes sense to assume this is the first teaser of an upcoming ZX-15R (and maybe a Concours 15 as well). That last thing either Dirck or I think the ZX-14R and Concours 14 need is more power, but supercharging is also a means to deliver lag-free power with much greater efficiency, so this could be a way to give us a mere 200 hp and still deliver excellent fuel economy and longer service intervals. 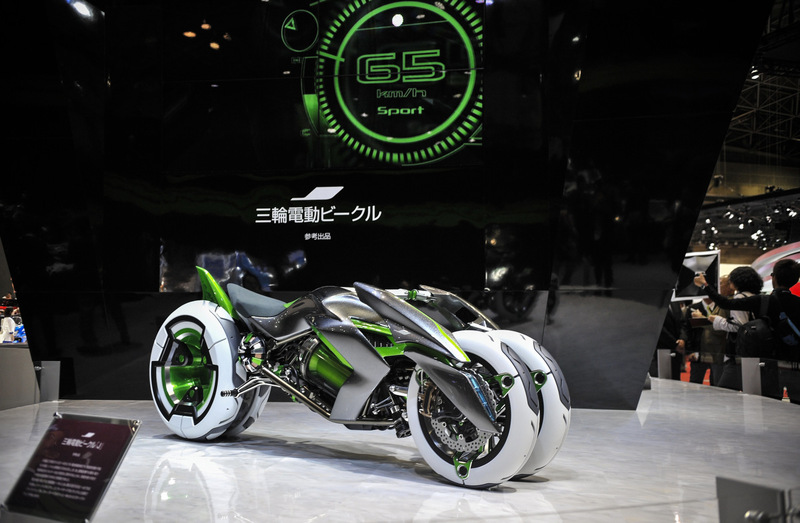 Hopefully we’ll have an answer before the next Tokyo Motor Show. Gabe Ets-Hokin is the Editor of City Bike magazine, and a frequent freelance contributor to MotorcycleDaily.com. Personally, I would like to see Kawasaki put one of these 4 cylinder engines (either 1400 or 1500) back in their Voyager tourers, the V-Twin just doesn’t cut it for me in any way. My Concours 14 definitely needs more power, like an eskimo needs ice. What it needs is a 100 less pounds, which this engine might theoretically provide if you could go to a 1000cc motor for the same power and torque (or theoretically more, but that would be ridiculous). 3 words… diet and exercise. I am almost shocked the motorcycle world has not turned back to forced induction. Superchargers make more sense probably but are more difficult to engineer. I can see why they have shied away from turbos. Reliability and ease of owner altering the boost must concern them. Engineered superchargers as part of the engine would be beyond casual fiddling by owners. There is zero reason for these plus 1000cc bikes if power is the criteria. I guess I am assuming a smaller forced induction engine with comparable power would be a smaller and lighter package. If not then I suppose the makers have been smart not to make the investment in the technology. I love concepts. They encourage a manufacture to think outside the box. While more concepts are for viewing only. It would be great to see a little performance based competition based upon concepts. This competition would have rules requiring new both new drive train and chassis constraints. Reminds me of what would happen if you tried turning a Huffy Mean Machine into a real motorcycle! Who knew that the KTM’s 1290 Superduke engine was detuned for low down torque and fuel economy? At least compared to Kawi’s 300X engine, it certainly is. This new found knowledge seems to take a bit of the wow factor away from the KTM. It’s not the biggest and baddest in the world, just the biggest and baddest the manufacturers will give to us peons (their ignorant customers). The 300X engine screams that they could do a whole lot better, just as easily as you or I could blow our nose. My eyes are now wide open. All this time, they as an entire group have been lying to all the performance junkies out there, saying they are giving their best when, in actuality, they were only providing lukewarm. Compared to what they actually could do, the new KTM is a mere mundane, unmanly, lackluster commuter bike. It’s no Hulk, it’s a Pee Wee Herman. Well, okay then. I take back what I said about the KTM 1290. Once again, it’s the baddest of the bad, until more scintillating info from MD makes me think otherwise. 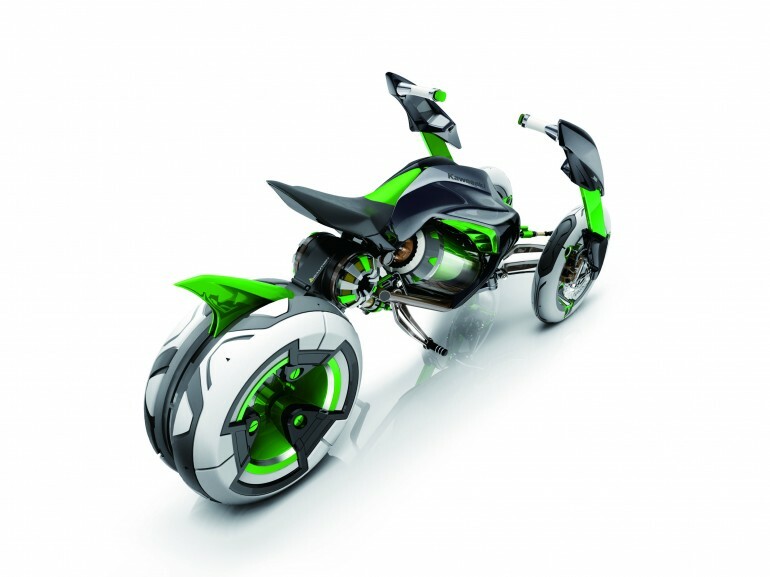 Shut up and take my money already, Kawasaki! I know I get a discount since I’ve owned 4 Kawasakis! Bag the blower and import the fuel-injected ZRX-1200! Obviously, the next bat cycle. If you think Honda’s styling is unnecessarily blocky, dull, and leaves much to be desired, Batman’s cycle takes this theme to a whole nuther level. Batman needs to trade in his cycle just for aesthetic reasons alone. Right now a kid on a 400cc KTM looks cooler and sharper than the Cape Crusader himself on his hippo of a cycle. A Dark Knight by definition is supposed to be cool, and he can’t be cool if his cycle isn’t cool. Kawi send these plans to Bruce Wayne, pronto. Yea, no wonder Batman wears a mask and only comes out at night. I’d wear one myself if my cycle was as ugly and stupid looking as his. Now picture yourself slamming on the brakes and flying between those joy sticks. It would be nice to have a dual purpose bike with those leaning front wheels. I could actually go over rough terrain without falling over. No beak please. Who needs a beak when you have a shark fin? Yes, shark fins: the new beak. All 3-wheel images are obviously computer animation. Can’t tell if the motor is real or not. It’s SOP for enthusiast sites such as this to perform purely marketing/advertising functions for manufacturers. I enjoy reading such articles. The author uses the word “display” which is ambiguous whether contents are animation or real 3-d objects. Later he states, “…it looks like a fun ride…” Cartoon images can’t be ridden, much less be fun! Then this: “…A more tangible product of KHI’s labors is this Supercharged Engine….” “More tangible” could mean the earlier subject had some tangible quality, yet one can not discern this from the article. Further, it hides whether the “engine” is tangible or not, yet there is no gray to the word “tangible.” Something is either tangible or not, or the observer lacks knowledge on the subject. The text seems to thoroughly blur or hide the actual physical or non-physical contents of KHI’s show “display.” I strongly dislike and disapprove of such writing style. When I wrote it, I assumed all exhibits in the Kawasaki booth were actual physical objects. Thanks for the trip into Jean Baudrillard-esque weirdness. I think this may be one of my favorite reader comments ever! Yes everyone knows a Concours does not have enough power for touring. why not just show a cold fusion reactor as the powerplant??? Or ad a flux capacitor. Fit that with a nice narrow high output gas engine and I would place the “J” right at the top of my list. Its a shame that it will likely never see production. The world could use something unique and category busting like that. While the awesomeness of a Kawasaki-made supercharger is undeniable, the thing I find most interesting about that photo is that the clutch cover arrears to be on the end of the crank. what’s that all about? Maybe the engine is that slim that they can afford to put the clutch there? in the other side it would be the power drive for the supercharger, the alternator probably stacked somewhere else, if a I4, would mean undersquare relationship for pistons. Does not seem like the correct placement for the clutch in any case of a motorcycle. The clutch would be too much spinning mass too far out from the centerline of the bike and too much spinning mass directly tied to the crankshaft. Offsetting the clutch and gearing it down (typical location/system for driving the clutch on an in-line 4) reduces the mass on the crank and moves it inward toward the centerline. no worries. cry not for the crankshaft (or Argentina). that’s car world SOP. ps: see entry for BMW G450X. You are looking at the flywheel/charging, the clutch would be on the right, and I can see a sprocket cover on the left rear portion where it should be. I think that this is probably a liter size motor making about the same power as the current 1400, so less rotating mass in a smaller package, great idea. Looks like something Marty McFly would ride. Time for an Akira sequel. 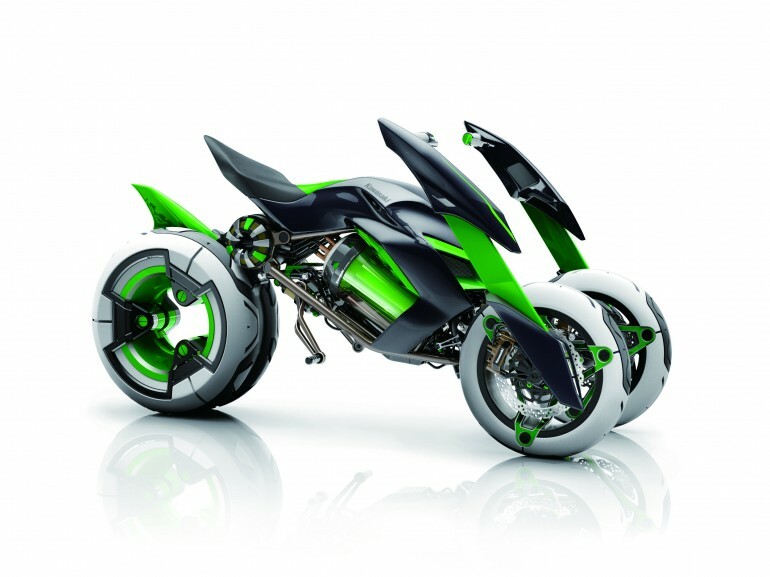 And a supercharged motorcycle engine would be cool, too. Supercharging. Yeah, like bikes today just aren’t powerful or fast enough. But with supercharging, you could make a lower displacement engine do the work of a higher displacement engine for less weight and probably better mileage. Why would it weigh less? It would simply have slightly smaller pistons PLUS the mass and complexity of the blower. The chassis still must be stout enough to handle similar or more power. It would probably weigh as much as the 14, or close. Fuel economy might be another story. With many cars now getting as good or better mileage as bikes, it is time to address this issue. yeah, they would really have to massacre the zed. like not only reducing displacement, but simultaneously reducing displacement AND lopping off 2 cylinders like Suzuki’s turbo 500. personally, I don’t see zed or connie owners wanting any parts of that. a reason they like those bikes is because they ARE big, roomy, and the weight actually affords stability on the highways (99% of US roads). fear no 18-wheeled turbulence. Maybe it’s just me, but i never got the whole “highway stability” argument. My first bike was a Honda CB250…a pathetic noodly little thing. I had read much about the turbulence from 18 wheelers, so the first time I saw one coming up from behind, I was nervous…only to discover a moment later that it was no big deal. car world will always hold a few ACES… aerodynamics plus 4 contact points allowing it to distribute it’s weight over a larger area (p=F/A). STUDEBAKER FOR THE WIN…!!! We should compare apples to apples with that conversation. A Ninja 300 or Honda cbr500 will both go 70mpg and run circles around any car capable of decent mileage. Mid-size scooters manage highway speeds and can get crazy good mileage. Without sophisticated variable valve timing and other tricks, high performance moto engines will always be inefficient at lower power settings. It’s a minor miracle that they run as well as they do at lower rpm. Ferraris get crap mileage too.